Bruce and Madonna join Prince on stage at Inglewood's Forum during his Purple Rain Tour. Bruce's (and Madonna's) participation on the latter two tracks is not absolutely confirmed, but seems likely based on Prince's shout of "Bruce!" near the beginning of "America". While the stage was bathed in purple light Bruce and Band (wearing purple clothing or accessories) pay tribute to Prince, who died April 21, by playing his classic hit-song "Purple Rain" as the show-opener. 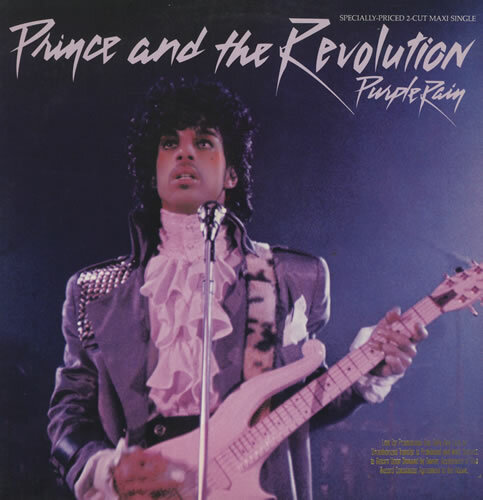 The song was played in its Prince And The Revolution full-band arrangement. The song was also soundchecked. 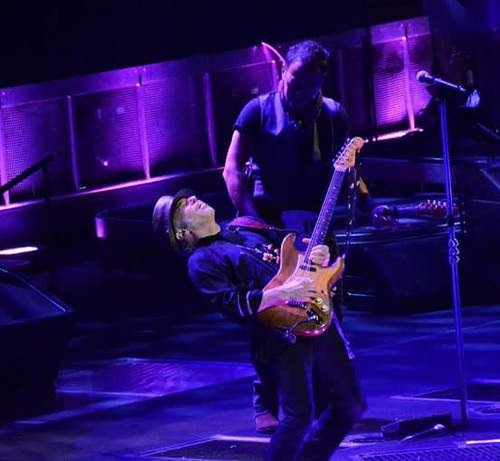 On 25 Apr 2016, a free MP3 of the live 23 Apr 2016 version of Purple Rain was released on Live.BruceSpringsteen.net. A pro-shot video was posted on Bruce Springsteen's official website and Bruce Springsteen's YouTube channel but for unknown reasons was taken off a few days later. Once again Bruce and the Band pay tribute to Prince, with "Purple Rain" opening the encores. Final tour appearances for "Purple Rain"
"Purple Rain" is a song by Prince and The Revolution. It is the title track from the 1984 album of the same name, which in turn is the soundtrack album for the 1984 film of the same name, and was released as the third single from that album. The song is a combination of rock, R&B, gospel, and orchestral music. It is considered to be one of Prince's signature songs. "Purple Rain" was originally written as a country song and intended to be a collaboration with Stevie Nicks. According to Nicks, she received a 10-minute instrumental version of the song from Prince with a request to write the lyrics, but felt overwhelmed. She said: "I listened to it and I just got scared. I called him back and said, 'I can't do it. I wish I could. It's too much for me.'" At a rehearsal, Prince then asked his backing band to try the song: "I want to try something before we go home. It's mellow." According to Lisa Coleman, Prince then changed the song after Wendy Melvoin started playing guitar chords to accompany the song: "He was excited to hear it voiced differently. It took it out of that country feeling. Then we all started playing it a bit harder and taking it more seriously. We played it for six hours straight and by the end of that day we had it mostly written and arranged." Prince explained the meaning of "Purple Rain" as follows: "When there's blood in the sky – red and blue = purple... purple rain pertains to the end of the world and being with the one you love and letting your faith/god guide you through the purple rain." The title track of Prince's preceding album, 1999, included similar references to a doomed ending under a purple sky ("...could have sworn it was Judgment Day, the sky was all purple..."). 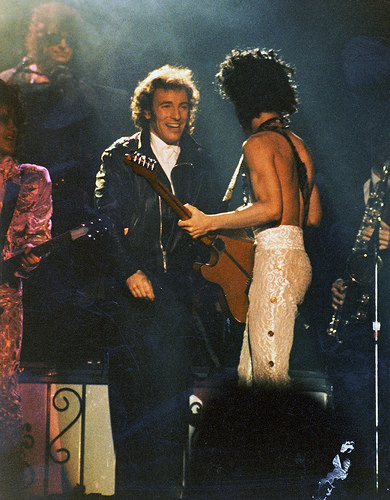 The only time Bruce Springsteen and Prince shared the stage was during a 23 Feb 1985 Price concert at The Forum in Inglewood, CA, when Springsteen joined Prince onstage . When Prince passed away Bruce opened his show with Purple Rain 3 times as a tribute to Prince . "Tonight we want to dedicate our show to Prince of course", he said. "There's never been any better bandleader, showman, songwriter, arranger. Whenever I would catch one of his shows I would always leave humbled. I'm going to miss that"